My name is Chun Hao Zhe. I happen to be 15 years old this year, and I am the eldest among the two of us siblings in my family. My 16th birthday is coming up on the 3rd of April next year, and I was born in Subang Jaya Medical Centre. I love reading storybooks related to science fiction and magic, and I occasionally play the piano and flute, excluding my holiday “homework” – the computer. In the past 15 years of my life, I have quite some achievements in both academic and co-curricular aspects. Unfortunately, as I am a person who dislikes sweating, I tend to avoid sports. When I was in primary school, my achievements were somewhat less than spectacular. As a minor member of the school Olympiad Mathematics team, I rarely shone in the lime light. The next part of my life however was littered in achievements. I first managed to get a High Distinction in the Junior Division of the Australian Mathematics Competition twice, something I have never gotten before. Recently, I also managed to score a Distinction in my Australian Mathematics Competition in the Intermediate Division. 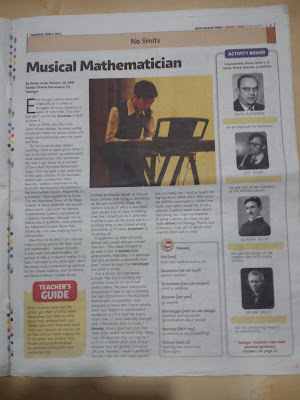 Meanwhile, as a musician, I have studied up to Grade 7 in ABRSM and passed with a merit, and also aced my Yamaha Fundamentals Grade 5, equivalent a diploma nowadays, although not an official one. In KUMON, I have also achieved Advanced Student Honor Roll. Technically, I am now studying Form 6 Mathematics. How did I do this? I can only say I have a strong passion for both music and mathematics. I believe not only in hard work and determination, but passion. If I like it, it doesn’t matter if it is hard, I will work to the bitter end. I don’t like using study or memorizing methods, but for certain subjects, such as History and Malay, I prefer to use such methods to improve myself, and so that I do not waste precious time trying to complicate myself with something simple. My motto in life is ‘Just do it!’, which is also Nike’s catch-phrase. Even if I hate it, I feel that I should just do it, otherwise it will be a stain on my achievements, and it’s a shocking thing to see a failure among distinctions, as if it bears testament to my giving up. In academics, I often compare myself with people who are smarter than me. This makes me want to go stronger and work harder to surpass their achievements. Nowadays, it is perceived that girls are better academically than boys. I intend to break that stereotype, and prove it wrong. When I was 12 years old, I entered a Mathematics Camp in Langkawi alongside four others, with the aim of being selected to be the few Malaysian representatives in a competition in Hong Kong. Of course, there is also the Australian Mathematics Competition, in which I emerged twice with a High Distinction and once with a Distinction. I also participate in marching band competitions, representing the Petaling Utama district. Currently, I am the Assistant Treasurer of the school prefect board. Also, since last year, I hold the position of Rank Leader for the Flute section and cleanliness committee representative in the school marching band. I am also the committee form representative for the school badminton club. There were many challenges that I faced in pursuit for excellence. My school examination results were less than satisfactory preceding PMR, especially in my weakest subjects: Mandarin and History. Also, by the time PMR came around, marching band practices were also somewhat distracting then. Afterwards, they became as fun as usual. And, of course, my parents placed restrictions on what I can and can’t do. Therefore, I missed this year’s prefect gathering thanks to PMR. No thanks there! My most memorable achievement … or achievements, to say, is to receive High Distinctions in the Australian Mathematics Competition. I was overjoyed to know that I actually reach such heights in mathematical excellence, as I first took the exams when I was 11 years old, and I only emerged with a Distinction twice then. In music, I daresay I have a good ear. I can hear most songs’ notes, and if someone sings them, I usually can tell what key they are singing it in (if it’s a definite pitch, that is) and whether are they getting somewhat off-tune. However, it’s not prefect yet, so I’m still working on it. I can also read notes quickly and accurately, especially duing sight reading, but I tend to forget the key signature, which disabled me to achieve a distinction in Grade 7 of the ABRSM examinations. While I love music and math and all, I would like to be a scientist. I wish to discover more about everything, but I have no intention of being a doctor. As I have not yet really divulged into Biology, Physics and Chemistry, I have yet to decide what scientific field I am to enter, and see what the future holds for me.